Blue and Gold Auto Decal with CDT Logo. 3½ inches in diameter. Must be a current CDT to purchase. 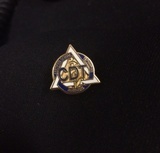 Silver Lapel Pin with engraved blue and gold CDT logo. ½ inch from point to point on the triangle. Embroidered Blue and Gold Smock Patch with CDT Logo. 4 inches in diameter. 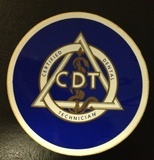 Market your Certified Dental Technician status with a roll of 1000 stickers of the Blue and Gold CDT logo. These stickers can be placed on the outside of each case you send to your dentist. Case box stuffers are the size of business cards and can be inserted into every case that you manufacture and deliver for a dental client. The case box stuffer states that a Certified Dental Technician manufactured the restoration. 1000 Case Box Stuffers with each order. Also available with "Made in the USA" on the front. Case box stuffers are the size of business cards and can be inserted into every case that you manufacture and deliver for a dental client. The case box stuffer states that a Certified Dental Technician manufactured the restoration and it was Made in the USA. 1000 Case Box Stuffers with each order. Also available without "Made in the USA" on the front. Duplicate CDT Certificate - frame quality. Materials Disclosure Form for Certified Dental Technicians to include with the cases sent to their dental clients.